When I met my husband I was a pseudo-vegetarian…I very rarely ate meat just out of taste preference (and being a broke grad student!) 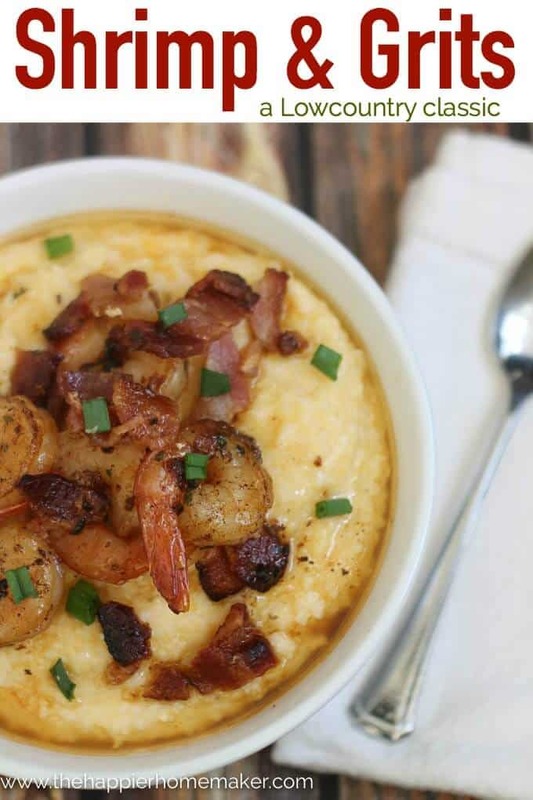 While I learned to cook and enjoy meat dishes after we were married (he’s a classic hearty meat and potatoes guy) I usually revert back to vegetarian or seafood options like this one when he deploys. 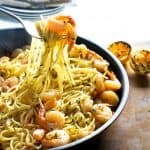 This Lemon Garlic Shrimp Pasta is one of my very favorite fast weeknight dinners to make when I’m in the mood for a lighter but flavorful meal. 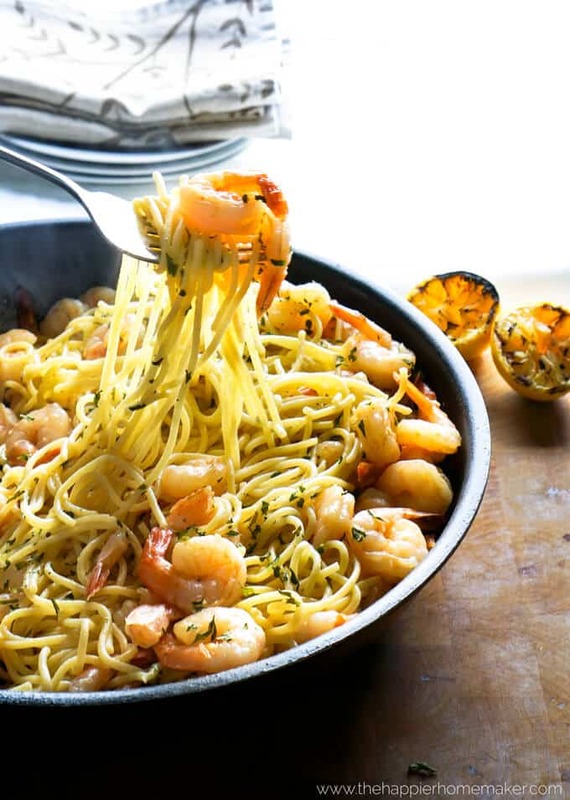 The lemon and garlic are the perfect compliment to the shrimp and tossing it with buttered pasta makes it mouth watering delicious! Prepare spaghetti according to package directions, set aside and keep warm. Meanwhile in a large saucepan melt butter over medium high heat. Add garlic and cook until fragrant, about 30 seconds. Add shrimp and salt and pepper and cook about 3 minutes until shrimp are bright pink and firm (don’t overcook!) Remove from heat and add cooked pasta, tossing to coat throughly. Add additional lemon juice if desired. Serve immediately. 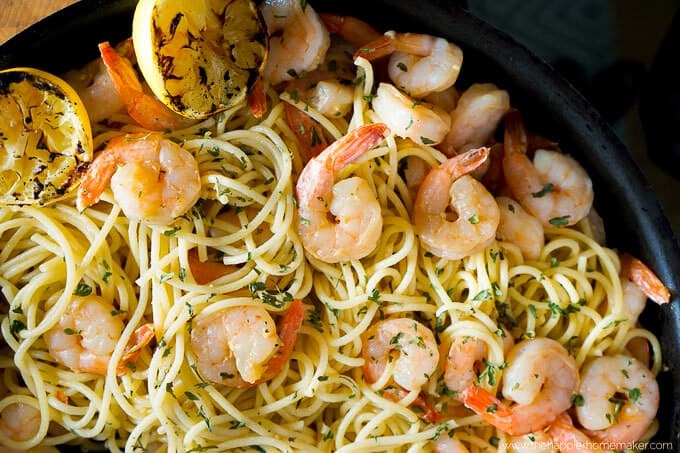 Flavorful lemon and garlic shrimp tossed with buttery noodles for an easy 15 minutes meal. Prepare spaghetti according to package directions, set aside and keep warm. Meanwhile in a large saucepan melt butter over medium high heat. Remove from heat and add cooked pasta, tossing to coat throughly. Add additional lemon juice if desired.